Personalized lime, royal & white 44” arc expressions auto – open umbrellas are visually appetizing and make a very excellent travelling companion. This umbrella is easier to carry within bag and offers great durability. It is a perfect gifting choice for marketers working in tight packed marketing budget. 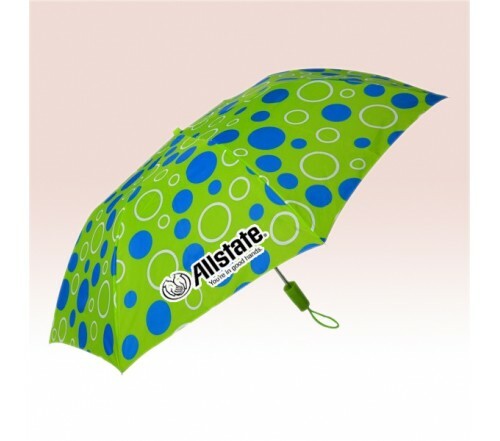 This umbrella cuts a remarkable appearance with its features – 44” arc sassy bubble design & polka dotted royal, lime and white canopy, metal shaft, and plastic handle. Dimensions - 44” arc folds to 15”. Imprint area - 91/4” W X 6 ¼ H X 6” Top.